5 multi-track CD's now available - each is listed below together with its tracks. There are also 2 single-track CD's available - follow the link at the bottom of the page for details of these. (Please note: For any track that is accompanied by the 'Ukulele' icon, there is a sample sound file to listen to. Just click on the little uke. This opens a small 'player' window, which plays the sample and remains open in case you wish to hear it again by clicking its 'Play' button. It will close and re-open if you click on another uke icon to play another sample, even if the current one hasn't concluded. It will close automatically when you navigate away from this 'Backing Tracks' page. 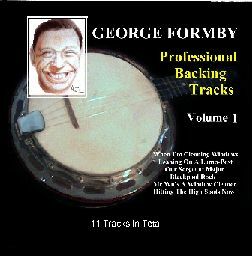 I have commisioned the production of a number of George Formby backing tracks. The music has been produced by professional musicians/arrangers working with top notch equipment and the tracks laid down in a recording studio. Every effort has been made to attempt to replicate the accompaniment which George used on his records. So the different instruments which are audible during George's performances appear on the backing CD version. I have acted as an advisor from the point of view of deciding on the keys in which the music is played and the tempo, format of the songs etc., (bearing in mind that few of us can match the Great Man's playing and singing prowess!!). With the sole exception of 'Windows' on Volume 1, there are two backing tracks for every song (each in a different key). The accompaniment does not compete with the singer as regards the melody of the songs but comes in strongly with the melody during the uke solo (so as to augment the audience's enjoyment of the skills of the player!). I have also made every effort to ensure that royalties are paid to the publishers of the original music. I have done some artwork of George for the CD cover, which hopefully adds to the fun, and the CD's are in Jewel cases. Volumes 1, 2, 3 and 4 are priced at �14 each. Volumes 5 and 6 are �12 each. All prices are in Sterling and include postage and packaging to the UK. If you wish to pay by PayPal or PayPal's Secure Credit Card facility then please contact me by 'phone or e-mail to discuss these payment methods. I am introducing a new service for customers who purchase one of my Backing CD's. (Sorry, but I cannot supply just the minidisc copies on their own). For an extra �8 per CD, I will include a minidisc copy of that CD. Please note that this price reflects the fact that I have to pay royalties on the minidisc copies as well as on the CD's. Volumes 1 and 2 contain all the most popular Formby classics, e.g., 'Windows', 'Lampost', 'TT Races', 'Chinese Laundry Blues' etc.. All (except 'Windows') are in 2 keys suitable for a uke in "C" and "D". 'Windows' is only in the key of "C". There are 6 songs on the this CD. 1. Out In The Middle East - "Fm"
2. Out In The Middle East - "Gm"
3. Smile All The Time - "C"
4. Smile All The Time -"D"
5. The Lancashire Toreador - "Am"
6. The Lancashire Toreador - "Bm"
7. The Ukulele Man "F"
8. The Ukulele Man - "G"
10. Get Crackin' - "G"
11. I Blew A Little Blast On My Whistle - "C"
12. I Blew A Little Blast On My Whistle - "D". The Ukulele Man - The original of this is complicated by lots of "answer backs " and key changes. This is the version which I have performed with approval at GFS meetings for a while now. It is simple but effective and puts the solo virtually in the middle of the song whilst staying in the same key throughout. All the tracks on Volume 4 are in "C" and "D" except 'Andy The Handyman' which is in the keys of "F" and "G". These are slower mixes for beginners or anyone who is not in too much of a hurry ! All the tracks on Volume 5 are in "C" and "D" except 'Our Sergeant Major' which is in the keys of "F" and "G". 1. Little Ukulele - "C" and "D". 2. With My Little Stick Of Blackpool Rock - "F" and "G". 3. Mr Wu's A Window Cleaner Now - "Am" and "Bm". 4. Lancashire Toreador - "Am" and "Bm". 5. Get Cracking - "F" and "G".